Jay Asher's Thirteen Reasons Why was a big hit, a book people talked about for a long time and still talk about. I enjoyed it myself and thought it made a great book club read since there was a lot to discuss. 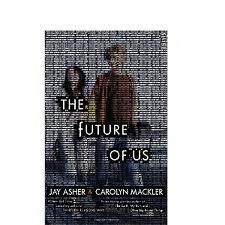 So this new book, The Future of Us that he co-wrote with Carolyn Mackler got a lot of attention. To be honest, I didn't know much about the book except for that I wanted to read it and I was thrilled to get it for Christmas. The premise of the book is very interesting, Emma gets an AOL CD ROM in 1996 and when she logs in, Facebook pops up. Of course, there is no Facebook yet, so at first she and her friend Josh are really perplexed by what's going on...is it a prank? But of course it can't be a prank, Josh thinks. Who would prank the future and talk about what people were fixing for dinner? (which LOL). They quickly become addicted to seeing their future, though, and surprised when choices they make in the present affect their future Facebook selves. Of course there's more to the story....Emma and Josh have been best friends forever and just six months before they discover Facebook-from-the-future Josh misread their situation and believed that Emma wanted more from their relationship than she did. But...she didn't and so things were awkward and strained between them until Facebook came along. Sharing the Facebook secret brings them closer together again and forces both of them to examine what they really want from their lives. I found this book to be utterly compulsive reading, once I started reading I didn't want to stop! Of course the idea of having the option to know your Facebook status in several years is really really appealing...but I think there was something else at work here...Emma was just a couple of years ahead of where I was in school so there was just tons of nostalgia. It was like reading a YA book about my youth! AOL! (lol I was always meant for the internet I got grounded from using it when we first got it because I always ran up the charges and I was kicked off AOL and forced to only use the free juno email. OMG the days! Thank god it's limitless now! ), phone cards!, having a cell phone being a novelty!, Dave Matthews and Greenday! plus I mean I think it's obvious this is a story about best friends realizing they want to be more and so it was a fun love story from that respect, too. It was also interesting to read how Josh and Emma dealt with learning surprising things from the future about the people they loved...things that very much affected the present and the way they saw their friends. The book is told in alternating viewpoints...and Emma first person chapter and then a Josh one. And both Josh and Emma have things they need to learn about themselves that Facebook helps them with. The Future of Us is just a super fun read, like a window back in time but also a reflection on the value of living in the here and now and making good choices now that will obviously affect your future. I highly recommend it for a fun time.